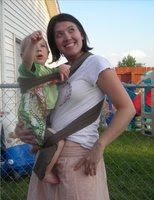 Steph at Adventures In Babywearing has another great giveaway this week. This one's for a not-yet-available to the masses newfangled baby carrier by All Natural Mommies called a Podonbutai, which combines elements of several Asian babywraps into one cool new package. Sign the Mr. Linky here for your chance to wear baby in jet-setting style. Oh, you're so silly, you supervillain! Thanks for entering! Heck I want to enter! Love those fabric wraps. My mom carried me in one!